The 2014 Ice & Fire calendar, illustrated by the amazing Gary Gianni, is almost complete. Those of you who were at Chicon may have seen some of Gianni's paintings at the Brotherhood Without Banners party, since he was kind enough to display half a dozen of them exclusively for the BWB and their guests. He's working on the twelfth and final painting now, and we expect the calendar to debut at this summer's San Diego Comicon. Which means that is time to get cracking on the 2015 Ice & Fire calendar, and we've done just that. I am absolutely thrilled to announce that the artwork for the 2015 calendar will be provided by a man who truly needs no introduction, the Hugo-award-winning artist extraordinaire DONATO GIANCOLA. Needless to say, I am a huge huge fan of his painting. This will not be Donato's first visit to Westeros. Years ago, he did a gorgeous painting of Melisandre of Asshai as the cover for the special Westeros issue of DRAGON magazine. Ever since, I have been wanting him to do more... and now at last it seems I'll get my wish. Oddly enough, only a week ago or so I was in DC, enjoying the amazing exhibition of Pre-Raphaelite art that has just opened at the National Gallery. Looking over Donato's on-line gallery with that so fresh in mind, it occurs to me that his own paintings could have fit right in with those of Millais, Hunt, Rossetti, and the other stalwarts of the Pre-Raphaelite Brotherhood. My friends at Bantam tell me that Donato is already hard at work, "far into reading the entire series, studiously taking notes, making thumbnails, etc." I expect we'll see some gorgeous things from him. And I must say, I am very pleased and proud with what our annual Ice & Fire calendar has become. Michael Komarck (2009), Ted Namisth (2011), John Picacio (2012), Marc Simonetti (2013), Gary Gianni (2014) and now Donato Giancola... if you love great fantasy art, it doesn't get much better than that. Did you see that portrait of JRR Tolkien he has on his website? Wow, just WOW. I can't wait to see his vision of your world. I've got the first four calendars all hanging on top of each other on my wall next to my computer. I just add a new one every year. But I don't think a fifth will fit on my wall hook. Time to find a place to store these. I love these! got Tolkien for a few years (When Ted Nasmith did a few from 2002-2004, the 50th anniversary of lotr and Children of Hurin) but once the Tolkien ones featured Cor Block's art, I stopped...not my style. Then, I switched to Ice and fire and will most likely stay with that. If there's a Tolkien calendar w/ the art in the style of Nasmith, John Howe or Alan Lee, it will be tough to decide...but as of now, I'm getting the Ice and Fire ones! God, you know Donato's work for this new calendar are just going to be stunning, cannot wait to see some of his character work, the one he did Melisandre was just so perfect. 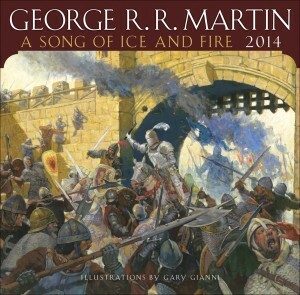 I too am amazed by the level of artists these ASOIAF calendars continue to obtain. Any chance there will ever be an ASOIAF day planner?? I would buy the heck out of it. Ha. I've actually got four calendars on the walls of my office, I love calendars so much. 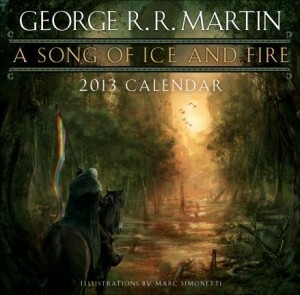 It will be cool if the the 2014 calender was the release date of TWOW, so we could all count the days until the release. Hey George, apologies for being off topic a bit, but do you plan on seeing Emilia Clarke in Breakfast at Tiffany's at all? I'm attending next Friday, 3/15. Excited to see her in a different role. I'd love to, but she's playing in NYC, and I am two thousand miles away in New Mexico. And my schedule is way too full already. You are a busy guy indeed. Best of luck to you with your upcoming and recurring endeavors from a fellow Bayonne-ian! Thanks for the good news. I am also one of the dinosaurs still using calendars. I still enjoy waking up in the morning and seeing the display of the calendar, the way it looks, the artwork...there is a curious mixture of feeling oddly unsettled and uncertain as I mark the passage of time, but also something strangely comforting at the same time. The artists having worked on the ASOIF calendars have been brilliant and it looks like that tradition will continue!